SEVERAL truckies told Spy about what they claimed was a white cow dead on the side of the Bruce Hwy between the small hamlets of Rollingstone and Bluewater. The driver who advised Spy said that nearby was a smashed sedan which had obviously hit the cow. Spy was sceptical but the evidence mounted as half a dozen other truckies who had also driven past the scene provided similar information. On the way back from Cairns Spy kept a close eye to see if the cow was still there. 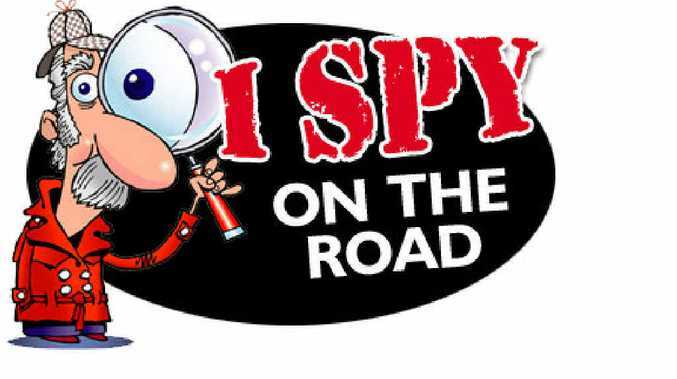 Indeed it was and Spy has vowed never again to doubt info passed on by our champions of the highways. A local media outlet also carried a small piece about a dead cow beside the road at Macrossan along the western Flinders Hwy. So the message when driving in those areas is to be on the lookout for wandering stock. ONE NSW truckie with a craving for ice cream stopped off at a well-known shop and checked out the extensive range of gourmet delights. He was with an assistant and ordered a cone with three scoops of his favourite flavours. However he asked the shop assistant if he could wash his hands in the kitchen before touching and then devouring it. No worries at all. But while the driver was cleaning any germs from his fine hands the shop worker inquired of his assistant: "What was he touching with his hands?" The reply left more questions than answers. "You just wouldn't want to know so I won't go there," he said. THIS was a road breakdown involving a Good Samaritan truckie which ended up being a genuine communication breakdown. This South Australian driver saw some damsels in distress beside a small mini bus which had a flat tyre. They obviously had no idea how to change it so he pulled up his rig and offered to assist. Only trouble was they were Japanese tourists who could hardly speak a word of English. Nevertheless our knight in shining armour got on with the job and changed the tyre, much to the joy of the lasses aged in their 20s. He couldn't understand a word they were saying before they headed off but realised they were appreciative as they all bowed. SEVERAL truckies were deep in slumber land having what Spy hopes were sweet dreams when they were awoken by a car alarm. It was beside a highway in a rest area and they emerged from their sleeper boxes ready to discipline the culprit. When they discovered it was an elderly couple who had tried to lock a hire car and instead activated the alarm they were more understanding. The couple apologised and were glowing in their praise of the truckies when they fuelled up at the next roadhouse. EXPECT the unexpected when on the job is the motto of many truckies Spy speaks to. It often surprises many just who they meet along the way in their day-to-day deliveries. One veteran Far North Queensland driver was having a nice break and a snack at a roadhouse when Spy had a yarn to him. They had never met before and off the cuff Spy mentioned that while on assignment he had managed to find a great deal on three nights accommodation at an upmarket Cairns Hotel for the price of two. Our truckie mate inquired which establishment it was and indicated he would book a few nights there with his wife. Spy handed the gent a card and four days later received a nice email from the truckie which included a pic of the scenery outside their room featuring idyllic Trinity Bay. A GROUP of four Victorian truckies went on a tour of the West Indies to see the home side battle it out with Australia in the three cricket Tests. These cricket enthusiasts enjoyed the calypso lifestyle but also seemed to have missed the life back home Down Under. From reports received by Spy they constantly phoned or emailed truckie colleagues in Oz to find out what was going on. It just seems the road transport industry is in their blood. While in the Windies they also checked out lots of trucks and mates can't wait to hear about it all upon their return. One report they conveyed back to Aussie mates was a strange incident which held up play in the first Test at Barbados. It was the kite flying season in the Windies and one blew onto the ground and the string attached to it ended up around some fieldsmen's legs and held up play briefly. At the time Aussie skipper Michael Clarke and Mike "Mr Cricket" Hussey were batting. The Aussies went on to win the Test late on the final day in fading light with three wickets in hand after being outplayed by the Windies early on.